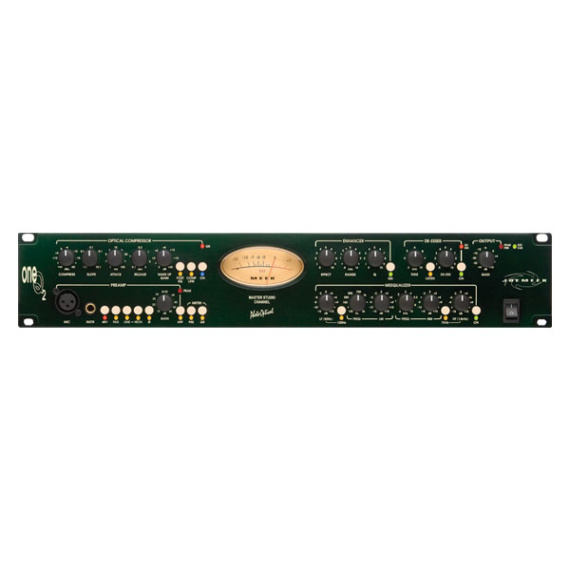 The Joemeek twinQ2 is everything you ever wanted in a dual studio channel – and then some! The Joemeek oneQ2 channel strip packs serious punch for pro studios and home recordists alike. Based on the same design as the acclaimed oneQ, sporting a mic pre, optical compressor, de-esser, enhancer, and 4-band EQ, with your choice of mic or line-level inputs for maximum studio versatility. And just like the original unit, the oneQ2 lets you switch the Cinemag transformer in and out of the signal path with the “Iron” button, for either “colored” or transparent audio. The oneQ2 has moved the transformer down the chain to post-line input, so now you can run line-level signals through the transformer to spice them up! Factor in sweet VU metering, an intuitive front-panel interface, and a DI input for recording guitar and bass direct, and you’ve got a serious studio workhorse with the Joemeek oneQ2 channel strip. One of the most useful features of the oneQ2 channel strip is the switchable transformer coupling, which lets you switch a Cinemag transformer in or out of the signal path to choose between two different sonic signatures. Switched off, you get the vibrantly transparent sound of Joemeek’s renowned microphone preamps, letting you hear the uncolored sound of your microphone and source sound. Switch the “Iron” mode on, and an iron transformer is switched into the signal path for a decidedly colorful character. Which setting to use depends on your sources and requirements of your mix, and you’ll love having the ability to choose what’s right for each recording you make. And now that Joemeek has moved the transformer in the oneQ2 to post-line input, you can run recorded tracks through the transformers to add a new vibe to them! This optical compressor has earned a solid reputation in broadcast, production, and mixing circles, thanks to its uncanny ability to produce great results quickly on virtually any type of program material. And thanks to the oneQ2’s addition of a highpass filter before the compressor circuit, you can cut out low rumble that you may not want the compressor to respond to, for a cleaner overall sound. You can link both channels for stereo compression tasks – and thanks to the available line inputs, you’ll find that the oneQ2 is a formidable unit just for compression! The sonic versatility of the oneQ2 channel strip makes it ideal for recording everything from detailed acoustic instruments and vocals all the way to raging guitar amps and direct-recorded bass guitar. It’s also fully suited to work as a standalone compressor or EQ, or both! And whether you prefer to track “flat” or with compression and EQ fully engaged, the oneQ2 has all the functionality – and impeccable sound quality – you need to get the sound right on the first take. Accepts mic, instrument, and line-level sources – a true studio workhorse! Take control of the world-famous Joemeek optical compressor and a whole lot more, with the oneQ2 channel strip!